We are experiencing many blessings today at RVCLC. and we are praising God. First thing this morning one of our 2016 graduates came by to share with us all the wonderful blessings God is doing in her life. She happily made a financial donation from her income tax refund and said she wanted to give back because this ministry means so much to her and her family. We are thankful. Our mentor training was a great success and we are thankful for the diligent effort on the part of Amanda and office volunteers that helped to make it happen. We are very thankful for Kaye Robertson and David Bourne who spoke. We are especially thankful for those who attended. 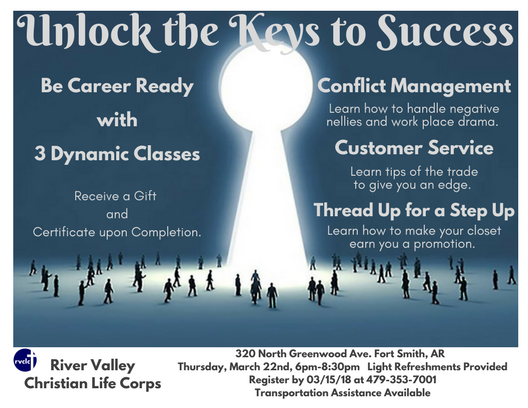 We are offering a Career Readiness Class on March 22 and will include that information for you at the end of this email. Please pray for our participants that their needs will be met and also that they will stay committed to moving forward. Please pray for Amanda and myself. We are both needing prayer in our personal lives. All is going well here at the office and our volunteers are amazing. We are very thankful for God’s goodness.